Ever since the meltdown in Florida starting on election day 2000, there has been a spotlight on how elections are run. Since that time, the states have been the venue for many election reforms, lawsuits, innovations, and controversies. There have been massive improvements in voting technology, rapid increases in early voting, and whole host of new procedures for handling ballots. There has also been a major increase in partisan debate about the administration of elections. This is where our book – The Measure of American Elections – comes in. It is an effort to move past assertions and ideological battles to provide systematic evidence about how well elections are conducted. The 2016 presidential election will be the first since our book was published. The book draws together leading experts in the field of election administration to investigate an array of indicators of how states and localities are performing. It draws upon a wide range of newly available data from the Census, the Election Assistance Commission, and the Pew Center on the States, among others. In short, we are bringing science to evaluate American elections. 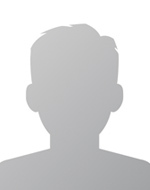 Let us highlight a few examples. 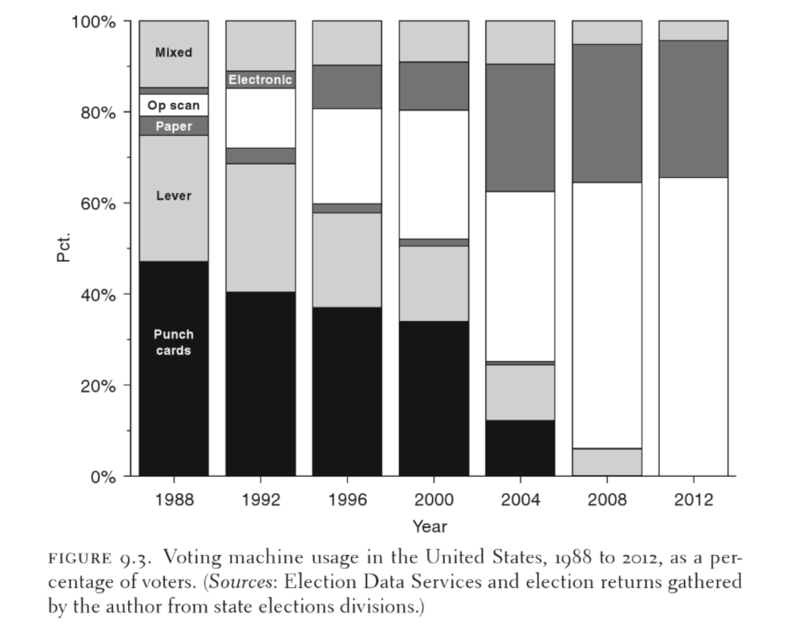 The revolution in voting equipment is clear in Charles Stewart’s chapter on voting machines. He documents the decline of notorious punch card and lever machines that made way for “optical scan” paper ballots and touchscreen machines. Stewart also demonstrates that better machines have led to fewer lost votes. Although such “residual” votes have fallen to just 1% nationwide, the states vary a lot in how many ballots go uncounted. In 2012 four times as many votes were uncounted in West Virginia as in Iowa. Barry Burden’s chapter reveals how much the states differ in the most basic measure: voter participation. In 2012 five states had voter turnout rates of at least 70%. But four states did not even manage better than 50%. Disparities in turnout are often due to factors beyond the control of policy makers, such as how competitive campaigns are in the state. Yet Burden also shows that provisions such as election day registration do help to increase turnout by several percentage points. Measuring election performance requires capturing the experiences of voters as they interact with the system. The chapter by Robert Stein and Gregg Vonnahme examines the voting experience in part by asking voters how they rated their voting places. 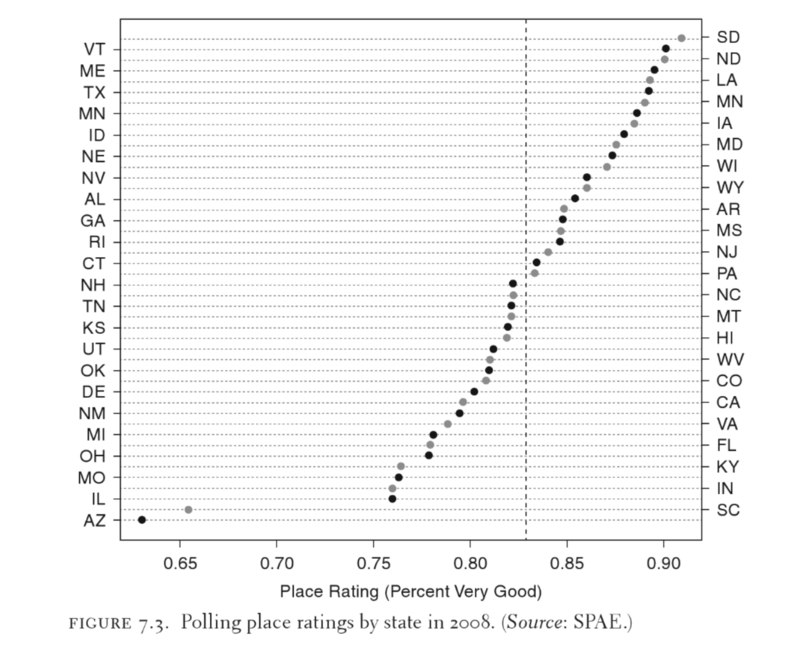 Voters in most of the country were quite satisfied with how polling places were run but not so in states such as Arizona and Illinois where marks were poorer. Stein and Vonnahme show that voter experiences are shaped by factors such as the use of early voting and opportunities to vote in locations that people frequent on a regular basis. Political campaigns are often hard fought, partisan, and even nasty, but our book shows how nonpartisan, scientific data and rigorous analysis can be used to improve how elections themselves are administered.